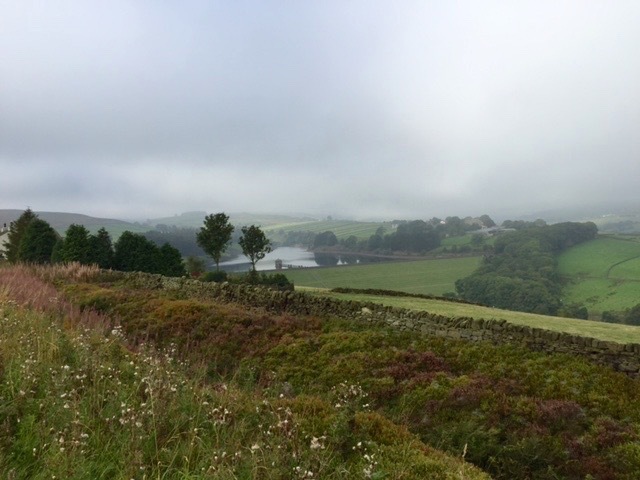 Moody, cloaked in fog, the Yorkshire moors come alive in the writings of the Brontes. As dramatic as the landscapes of the Peak District were (see previous post), I found their equal on the moody moors of Haworth. It was here that the Bronte sisters lived, wrote and died — all too tragically young — and where I had long wanted to wander. I’d re-read Charlotte’s “Jane Eyre” before we arrived, and was halfway through Emily’s “Wuthering Heights” when we visited the parsonage that was the family home from 1820 to 1860. After the untimely death of his wife, the Brontes’ preacher father was left alone to raise his three young gifted girls and talented but troubled son. Fortunately, their kindly aunt came to live with and care for them. 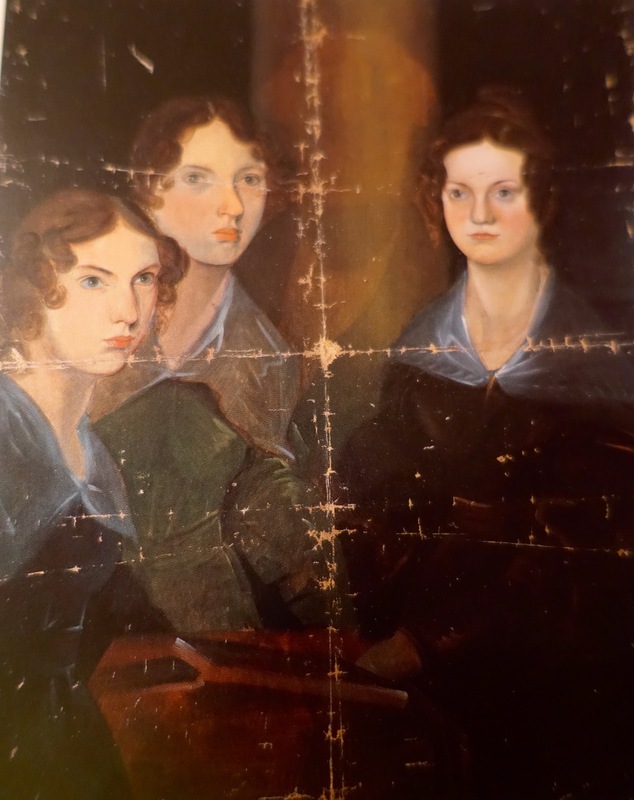 Branwell Bronte included himself in a portrait of his sisters but later painted himself out. Judging from the excellent exhibit at the parsonage (now a museum), the children were much loved and encouraged to pursue their many interests and rich fantasy lives. Early on, they delighted in telling tall tales of mythical kingdoms full of colorful characters. They made miniature books to record their stories, and learned to sketch and paint, too. The parsonage is full of their things: paint boxes and sketch books, drawings and letters, gloves and books and pottery; their piano and several of those delicate little paper books. Charlotte’s wedding bonnet. Anne’s bloodstained handkerchief; just 29, she died of tuberculosis. Emily would be gone at 30; their brother Branwell, a victim of alcoholism. Charlotte, pregnant, dead at 39. Their father, then, fully alone. 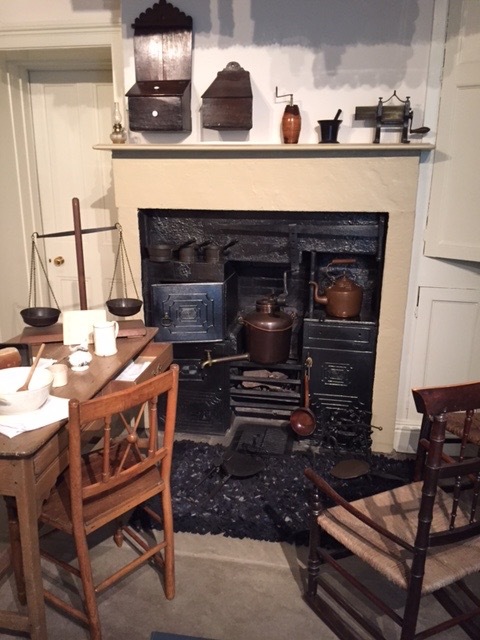 The kitchen contains many objects from the Bronte family. And so to walk the paths they walked and see what they saw — the scrappy shrubs and coarse grasses that cling to these rocky, rolling hills, the thickets of fern growing chest-high; heather creating patches of purple haze. There are pastoral scenes, too. Brilliant green pastures dotted with shaggy sheep; tan fields readied for planting; rows and rows of tidy stone fences (most standing for decades despite the lack of mortar to hold them in place). Here we roamed, faces forward into the autumn sun and wind, immersed in the physical world that so informed the interior/emotional landscapes of the characters these writers so vividly drew. Having sent the menfolk off to watch rugby, Tina Carpenter and I trudged on to the top of the moor where the ruins of a stone farmhouse stand. Some locals insist it’s the model for Wuthering Heights, but scholars beg to differ. Still, as you cross “the Bronte bridge” below, it’s easy to imagine that Rochester or Heathcliff might appear from behind the rocks at any minute. This was, for me, one highlight of our trip. We’d walked more than 11 miles that day, but it was worth the sore feet and tired bones. More days of tired feet and sore bones were coming up, but hey, you only go around once. 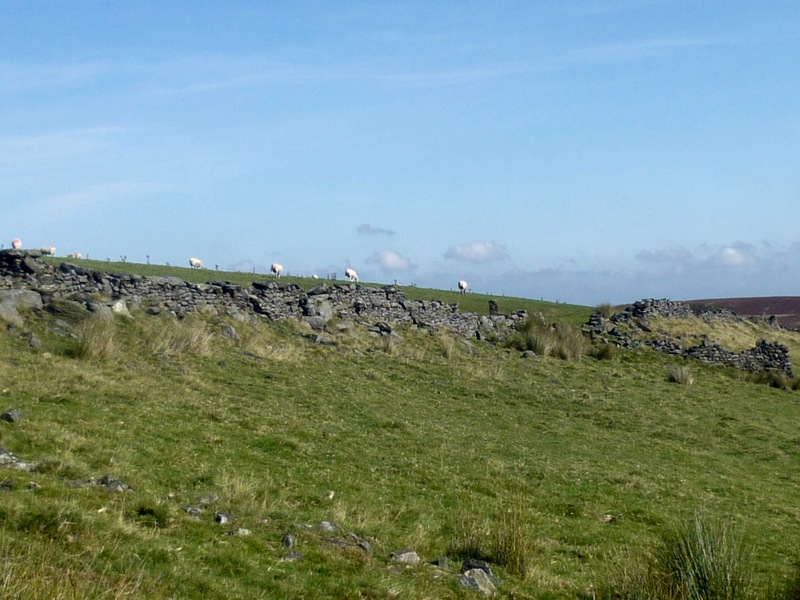 The higher land, too rocky for farming, is given over to sheep. Posted on October 4, 2015 October 4, 2015 by jbsaulPosted in TravelTagged Brontes, Haworth, moors, Yorkshire. Definitely a pretty, somewhat melancholy with the fog, place. Played there in 1993 while on tour with the Bytown Blues Old Boys. Just desire to say your article is as amazing. The clearness on your post is simply cool and i could assume you are an expert on this subject. to stay up to date with impending post. Thanks 1,000,000 and please continue the rewarding work.